Outreach ministries in the Province of Saint Barbara focus on serving people in communities of need, primarily in large urban centers. The largest outreach efforts under the auspices of the Province are located in San Francisco, Los Angeles, and in the city of Guaymas, Sonora (Northern Mexico). At these centers food distribution is the major work, and emphasis is placed on creating a welcoming and joyful environment. In this ministry, how things are done is always as important as what is being done. Today these three ministries—St. 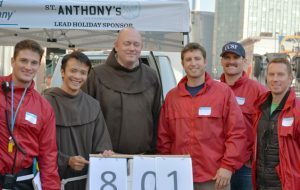 Anthony Foundation, St. Francis Center, and Casa Franciscana—serve a total of more than one million meals to the hungry each year! They offer the light of human connection – friendship, brotherhood and sisterhood - to any and all who come to the door. Among other services offered are medical care, social services, clothing, employment assistance, addiction treatment, and programs of advocacy engaging local government and civic leadership.